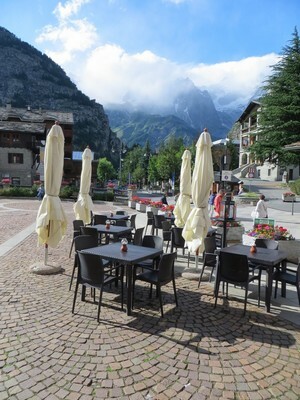 This page about Courmayeur was not in the original plan, but then we had planned to stay in France at Chamonix. 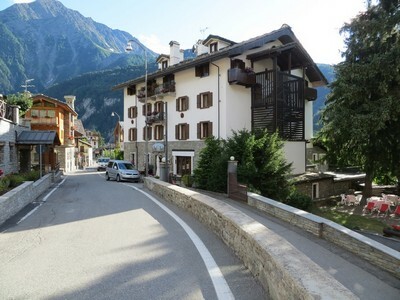 Courmayeur is a pleasant small Italian town in a beautiful location. I liked it and I took quite a few photos. This webpage is a convenient place to store the photos and it can give readers a flavour of the place if they are thinking of visiting it. 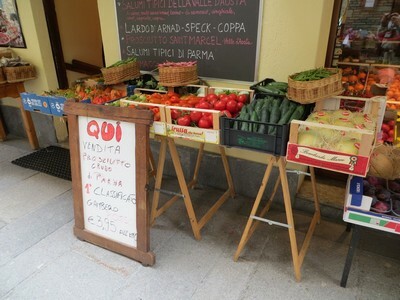 Via Roma is the main shopping street for tourists. 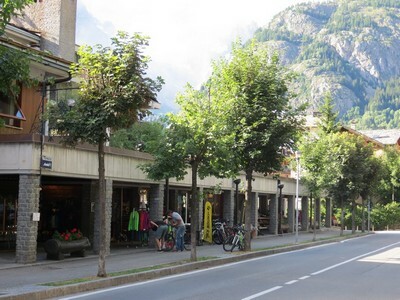 It is pedestrianised and surfaced with blocks or slabs. 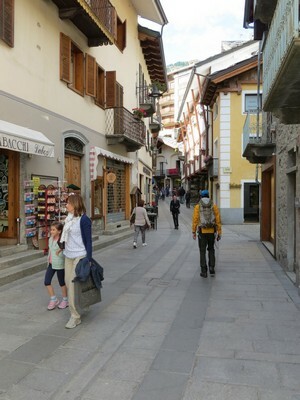 Width is variable from place to place, but there is a sheltered feel with tall buildings either side of the street. 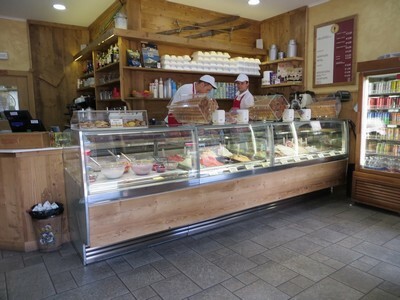 As well as many shops providing sporting and relaxing clothing to flatter the wearer there are food shops with something of an emphasis on edible gifts. 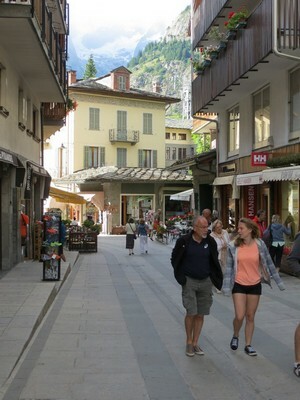 Courmayeur is a town among the mountains and this is reflected in a proportion of the people you see in the streets. 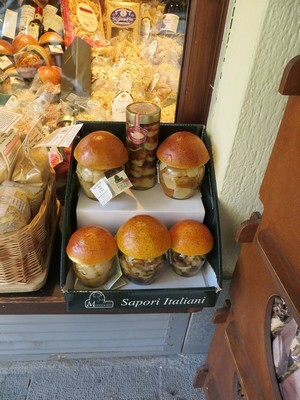 Elsewhere there are a few shops that look as though they are trying to feed people well. 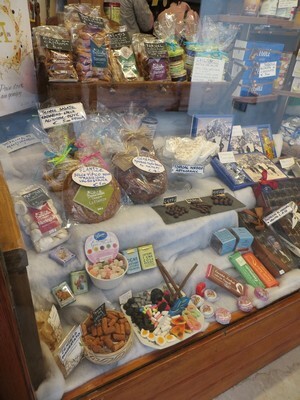 Some of these shops make me feel hungry! 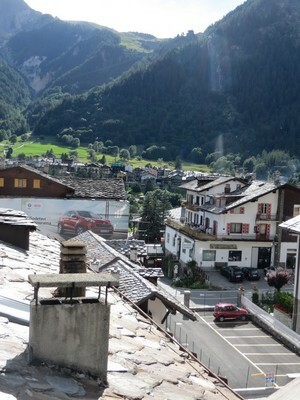 The shopping street has a few places where breaks among the buildings allow rooftop and mountain views beyond the river. 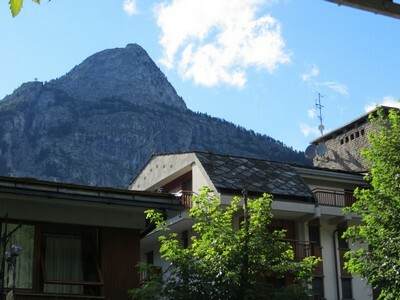 Mountains to the north are tall and close enough to show even over the buildings. The whole effect is one of beauty and elegance. 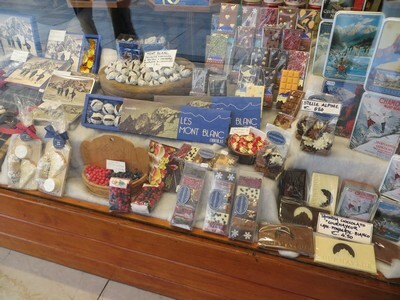 Outside the main tourist area there are tarmac roads full of cars and buses and shops that will attract everyone. 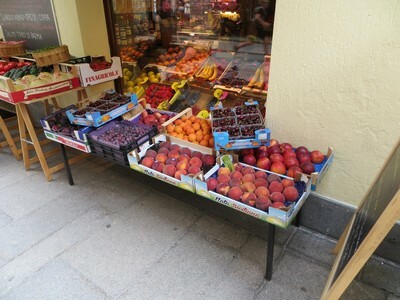 These include food stores with all that is needed to feed people. 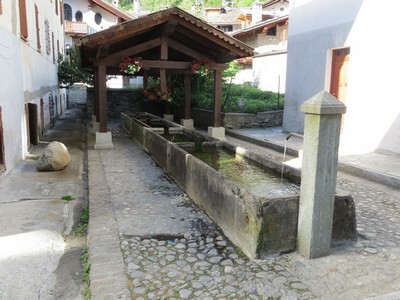 In one place there is preserved an old community clothes-washing trough. 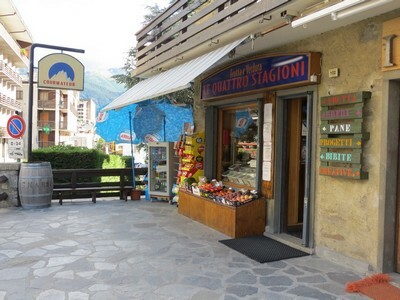 Just by it is the provisions shop to which I used to take clients when I was leading walking tours on the Tour du Mont Blanc route. Nice to see it again. 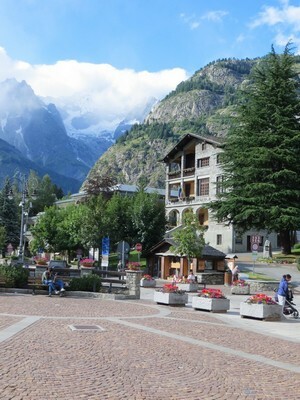 Mont Chetif uses its proximity to tower over the shops and the town. 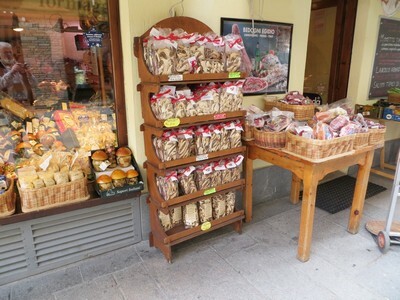 As a town for summer tourists and winter skiers it has no shortage of hotels and eating places. 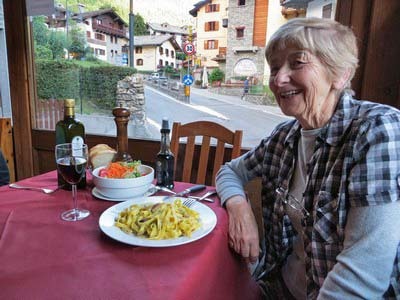 Some restaurants offer excellent value and good food for the hungry. 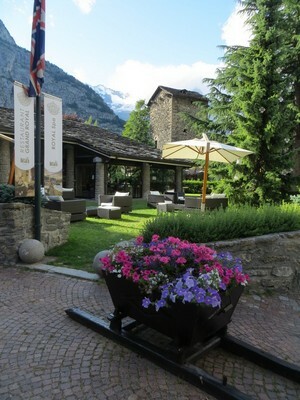 You will find the mountaineers there, enjoying their food amongst the locals.